China’s skies may be toxic, and its rivers fetid and prone to sudden infestations of pig carcasses. But according to a new study, the country’s environmental battle has also been making quiet, measurable progress. The paper, a collaboration between U.S. and Chinese researchers published in this week’s issue of Science, found that China’s ecosystems have become healthier and more resilient against such disasters as sandstorms and flooding. The authors partly credit what they describe as the world’s largest government-backed effort to restore natural habitats such as forests and grasslands, totaling some $150 billion in spending since 2000. “In a more and more turbulent world, with climate change unfolding, it’s really crucial to measure these kinds of things,” says Gretchen Daily, a Stanford biology professor and a senior author on the paper. The study didn’t examine air, water or soil quality, all deeply entrenched problems for the country. Beijing’s investments in promoting better ecosystem protection were triggered after a spate of disasters in the 1990s. 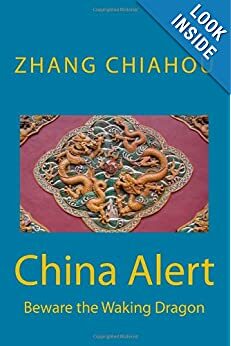 In particular, authors note, two decades after China started to liberalize its economy, rampant deforestation and soil erosion triggered devastating floods along the Yangtze River in 1998, killing thousands and causing some $36 billion in property damage. The government subsequently embarked on an effort to try to forestall such environmental catastrophes. According to the study, in the decade following, carbon sequestration went up 23%, soil retention went up 13% and flood mitigation by 13%, with sandstorm prevention up by 6%. The paper also involved authors from the Chinese Academy of Sciences and the University of Minnesota, among other institutions. Data was collected by remote sensing and a team of some 3,000 scientists across China, said Ms. Daily, who praised the “big-data” approach to tracking the quality of China’s ecosystems. “The whole world is waking up to the need to invest in natural capital as the basis for green growth,” she said. Reforestation was one particular bright spot, she said. Under the country’s founding father, Mao Zedong, China razed acres of forests to fuel steel-smelting furnaces. To reverse the trend–and combat creeping desertification in the country’s north — the country embarked on a project in 1978 to build a “Great Green Wall” of trees. Today, authorities say that 22% of the country is covered by forest, up 1.3 percentage points compared with 2008. The authors note that the study has limits. While China has reported improving levels of air quality in the past year, urban residents still choke under regular “airpocalypses.” The majority of Chinese cities endure levels of smog that exceed both Chinese and World Health Organization health standards. 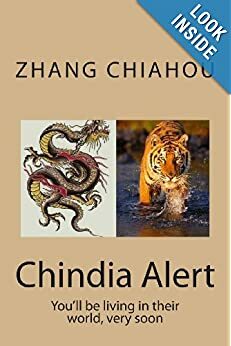 ON TAKING over in February as China’s minister for environmental protection, Chen Jining said the country needed an environmental law that was “not a paper tiger” but rather a “sharp weapon with teeth of steel”. Early indications, among them the cancellation of a series of dam projects on the upper reaches of the Yangzi river, are that the former academic and university administrator intends to follow through on his fighting words. State media have reported that the builders of the Yangzi’s Xiaonanhai dam—expected to cost 32 billion yuan ($5.1 billion) and to generate two gigawatts of electricity—were denied permission to continue because of the harm it would cause to a nature reserve that is the last remaining habitat for many species of rare fish. Work on its foundations began in 2012, but was halted while the environment ministry assessed the project. Two smaller dams on the same stretch of river were also rejected. Activists in China welcomed the decision, saying it showed a new determination to enforce environmental rules. 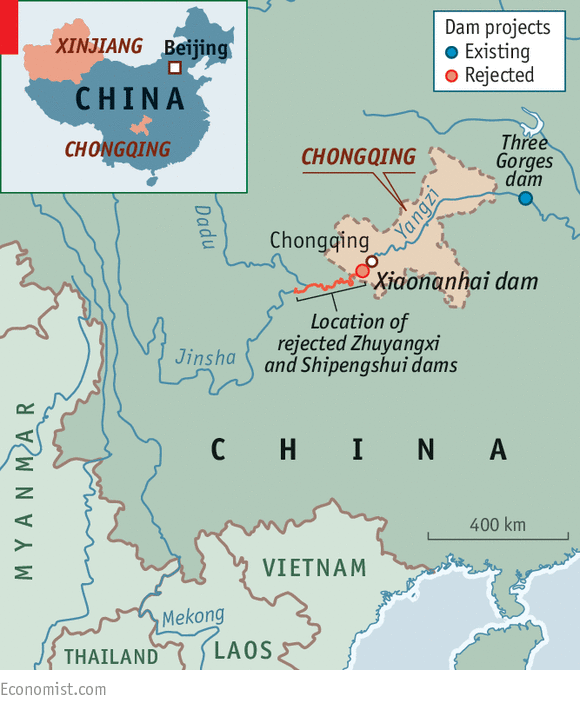 According to Ma Jin of the Institute of Public and Environmental Affairs, a Chinese NGO in Beijing, the firms that applied to build the dams, led by the Three Gorges Project Corporation, had previously won permission for other dams that would endanger fish populations by arguing that the protected nature reserve near the Xiaonanhai project would guarantee their survival. That, he says, makes the project “particularly outrageous”. via Enforcing environmental rules: Saving fish and baring teeth | The Economist. China on Friday opened a key section of a massive and ambitious plan to transport water from wetter central and southern parts of the country up to its arid north, including the capital Beijing, state media reported. The $62 billion undertaking – dreamed up by former Communist Party leader Mao Zedong in the 1950s – is designed to supply China’s parched and pollution-ridden north, home to more than 300 million people and countless water-intensive businesses. The latest section opened begins at Danjiangkou reservoir in central China’s Hubei province and runs for 1,432 km (890 miles), the official Xinhua news agency reported. It can supply on average 9.5 billion cubic meters of water annually for about 100 million people in places like Beijing, Tianjin and the nearby provinces of Henan and Hebei, Xinhua said. Some provinces in northern China have less freshwater per person than the desert countries of the Middle East. Of the country’s total, water-intensive industries such as clothing and electronics manufacturing consume a quarter – a share the think-tank 2030 Water Resources Group expects to grow to a third by 2030. The first stage of China’s south-to-north transfer brought water to the industry-heavy northeast, but it was barely useable when it reached Tianjin because it picked up pollutants and sediment while flowing north through polluted soil. That has raised concerns about the latest phase – a decade in the making – bringing water via a different, less polluted route. Some experts have also voiced concern that the project’s extensive tapping of water from the Yangtze River and its tributaries may damage one of China’s most important water ways. via China opens key section of massive water project | Reuters. It wasn’t long ago that China was the cheapest place on earth to make just about anything. When China joined the World Trade Organization in 2001, the average hourly manufacturing wage in the Yangtze River Delta was 82¢ an hour. Oil was $20 a barrel, so no matter where you were ultimately selling your Chinese-made goods, it didn’t cost much to get it there. China’s still cheap, but it’s nowhere near the deal it was just a few years ago. Workers in the Yangtze make almost $5 an hour today, and oil costs about $85 a barrel. Suddenly the benefits of making things in China aren’t so apparent, especially if you’re selling those things to consumers in the U.S. A new survey by Boston Consulting Group found that 16 percent of American manufacturing executives say they’re already bringing production back home from China. That’s up from 13 percent a year ago. Twenty percent said they would consider doing so in the near future. American manufacturing’s increased competitiveness against China is a story that’s been told for a few years now, giving rise to the term “reshoring.” But it’s not just China that the U.S. is gaining against. For companies making goods for sale in the U.S., Mexico has long been the place to go—and that’s slipping, too. The BCG survey shows that the U.S. has passed Mexico as the place where companies are most likely to build a new plant to make things to sell in the U.S.
via China’s Rising Wages and the ‘Made in USA’ Revival – Businessweek. THREE years ago the residents of Hualiba village in central China’s Henan province were moved 10km (six miles) from their homes into squat, yellow houses far from any source of work or their newly allocated fields. These days only the very young and very old live there. Close to their old farms, a giant concrete canal now cuts a swathe. From October 31st the channel will gush with water flowing from China’s lush south to the parched north. The new waterway is part of the biggest water-diversion scheme in the world: the second arm of what is known as the South-North Water Diversion Project. This is designed to solve an age-old imbalance. The north of China has only a fifth of the country’s naturally available fresh water but two-thirds of the farmland. The problem has grown in recent decades because of rapid urban growth and heavy pollution of scarce water supplies. The result is a chronic shortage. The World Bank defines water scarcity as less than 1,000 cubic metres (35,300 cubic feet) of fresh water per person per year. Eleven of China’s 31 provinces are dryer than this. Each Beijing resident has only 145 cubic metres a year of available fresh water. In 2009 the government said that nearly half the water in seven main rivers in China was unfit for human consumption. All this has encouraged ever greater use of groundwater. Much of this is now polluted too. In 1952 Mao Zedong suggested the north could “borrow” water from the south. After his death China’s economic boom boosted demand for such a scheme and provided the cash to enable it. In 2002 the diversion project got under way. An initial phase was completed last year. This involved deepening and broadening the existing Grand Canal, which was built some 1,400 years ago, to take 14.8 billion cubic metres of water a year more than 1,100km northward from the Yangzi river basin towards the port city of Tianjin. In late October the second, far more ambitious and costly route is due to open. 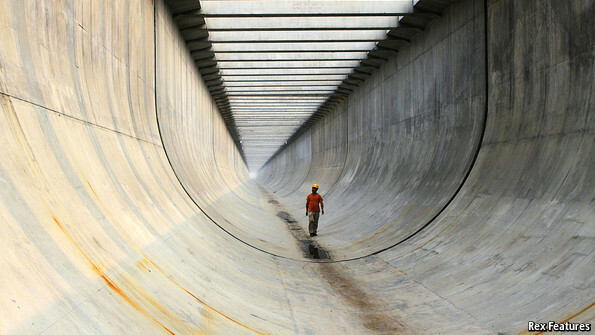 This new watercourse, over a decade in the making, will push 13 billion cubic metres of water more than 1,200km from the Danjiangkou dam in the central province of Hubei to the capital, Beijing. The aim is to allow industry and agriculture to keep functioning; already in 2008 Beijing started pumping in emergency supplies from its neighbouring province, Hebei. The new canal will help avert an imminent crisis. But the gap between water supply and demand will remain large and keep growing. The transfer will supply about a third of Beijing’s annual demand. A spur of the canal will provide an even greater proportion of Tianjin’s. But these shares will shrink over time. Even if people use less water, population growth, the expansion of cities and industrialisation will increase China’s overall demand. By lubricating further water-intensive growth the current project may even end up exacerbating water stress in the north. Shifting billions of cubic metres across the country has caused huge disruption. The government says it has moved 330,000 people to make way for the central route. Laixiang Sun of the University of Maryland in America reckons the number uprooted is at least half a million. There will also be health and environmental costs. Diverting river-water northward could promote the spread of diseases common in the south, particularly schistosomiasis, a debilitating snail-borne disease. Reduced flow in the Yangzi may make coastal water supplies vulnerable to intrusion by seawater and increase the potential for drought. The financial cost is also high. Mr Sun puts the cost of the project at more than $62 billion—far higher than the original $15 billion price tag. His estimate does not include the running of the project or the building of 13 new water-treatment plants to clean the water. By increasing supply, the government is failing to confront the real source of the problem: high demand for water and inefficient use of it. Chinese industry uses ten times more water per unit of production than the average in industrialised countries, according to a report by the World Bank in 2009. A big reason for this is that water in China is far too cheap. In May 2014 Beijing introduced a new system that makes tap water more expensive the more people use. But prices are still far from market levels. Officials turn a blind eye to widespread extraction of un-tariffed groundwater by city dwellers and farmers, despite plummeting groundwater levels. Raising the price would cut demand and encourage more efficient use. It should also help lure industry away from water-scarce areas where prices would be set at higher rates. Arid areas that are forced by the government to pipe water into desiccated cities like Beijing could offset their losses by charging higher tariffs. via Water consumption: A canal too far | The Economist. Two men pretending to be United Nations officials were arrested on Saturday in the city of Yueyang, Hunan Province. Wielding certificates that read “special pass of the United Nation‘s maintenance forces’ general headquarters” and “work permit for global maintenance and liaison of world peace,” the two men demanded the release of a prisoner on bail for medical treatment. They presented their release permits approved by the nation’s top leaders to Yueyang prison officers, Yangtze Information Daily reported, threatening to call Beijing’s Zhongnanhai leadership compound. The prison guard doubted their story and requested backup while pretending to cooperate with the UN officials. When the relevant authorities arrived, one huxster reached for his phone and said he was calling a top official in Beijing, flashing photos of the leader and himself at bemused officers. Police investigators said the conmen had been hired by the prisoner’s relative for their far-reaching connections and ability to solve problems. 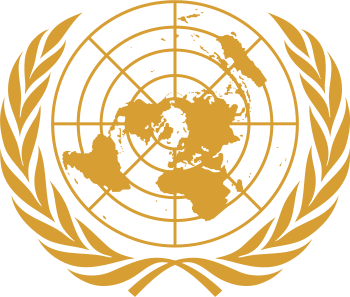 via Fake UN officials arrested – Global Times. Each year, China’s Ministry of Environmental Protection (MEP) releases a “state of the environment” report (PDF); it’s a rather grim annual ritual. For all the talk about China’s new “war on pollution” and money pouring into wind farms and river cleanup campaigns, the reality is that, according to most metrics, China’s environmental situation is getting worse, not better. Air pollution in China receives the most attention globally. Despite a recent stretch of fairly nice days in Beijing, according to the MEP’s report, in 2013 only three major Chinese cities met the government’s own standards for urban air quality. Water pollution—and water shortages—may be an even graver problem. The pollution level in several major rivers, including the Yangtze and its tributaries, has grown more severe since 2010. 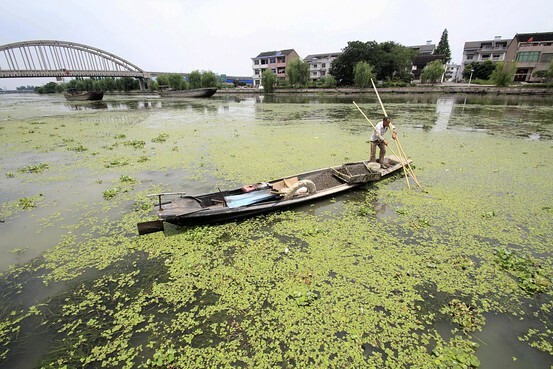 Meanwhile 11 percent of the land in the Yangtze’s watershed and adjacent areas was watered by acid rain. Sixty percent of groundwater-testing sites nations wide ranked as “poor” or “very poor” in water quality. via Air, Water, Soil: China’s Environment Gets Worse – Businessweek. Say you’re the leader of the world’s No. 2 economy. You just signed a massive energy deal with your Russian counterpart that has major political and economic implications – and that, under international protocol, calls for a big-time state wingding. At the same time, you’re pushing a government austerity platform to convince your people that their leaders aren’t corrupt fat cats living large off the people. That’s the dilemma Chinese President Xi Jinping faced this week after he reached a 30-year, potentially $400 billion gas supply deal with Vladimir Putin. His answer, it seems, was to split the difference. The state dinner that followed the high-profile deal-signing had enough fancy dishes, tipple and desserts to fail the sort of austerity test Mr. Xi might apply to, say, a banquet thrown by county-level officials in a tier-three burg. Still, experts said, the wines steered more to the local than to the Bordeaux, and the whole affair fell short of what you might get at a fancy wedding. After 10 years of difficult negotiation, China and Russia signed a landmark natural-gas contract on Wednesday. The night before, Chinese President Xi Jinping and his wife Peng Liyuan hosted a dinner in Shanghai welcoming more than 300 guests from 46 countries, including Russian President Vladimir Putin. What dishes were served during the 90-minute dinner? The dinner was definitely more elaborate than the “four dishes and one soup” set promoted by Xi Jinping as a form of domestic cost-cutting. There were four plates of desserts alone—implying that the anti-corruption rules don’t always apply when it comes to state events, as China doesn’t want to lose face on diplomatic occasions. The six appetizers included mashed green beans, spicy cabbage, sliced whitebait, a pea dish and bamboo shoots with green onions. The five dishes and one soup served included shrimp balls, fried and braised beef, macadamia nuts with greens, flatfish with bean curd sauce, luffa with green beans and mushroom with fish maw. Other dishes included moulded pudding, vegetable dumplings and plates of fruit. This dinner was intended to be a creative combination of Chinese and western-style cooking, one that highlighted fresh ingredients from southern regions of the Yangtze River. The executive chef behind it, Su Dexing, was also the chief cook for the state banquet during the APEC meeting in 2001, according to Shanghai International Convention Center staff. As at many state events, China’s ubiquitous luxury liquor Maotai was also served, along with a dry red and dry white wine produced by Cofco Wines & Spirits. According to prices advertised on e-commerce websites, such red and white wine would likely cost between 400-600 yuan ($64-96) per bottle and 300 yuan per bottle, respectively. Although abundant, the dinner was still simple compared to other options available in Shanghai, where wedding banquets can easily cost a minimum of 500 yuan per person, excluding liquor. In 5-star hotels, such meals might cost more than double that amount. 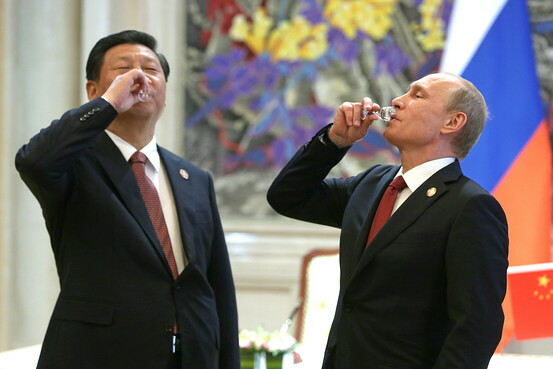 via ‘Four Dishes, One Soup’ Not Enough For Sino-Russian Gas Deal Celebration – China Real Time Report – WSJ.